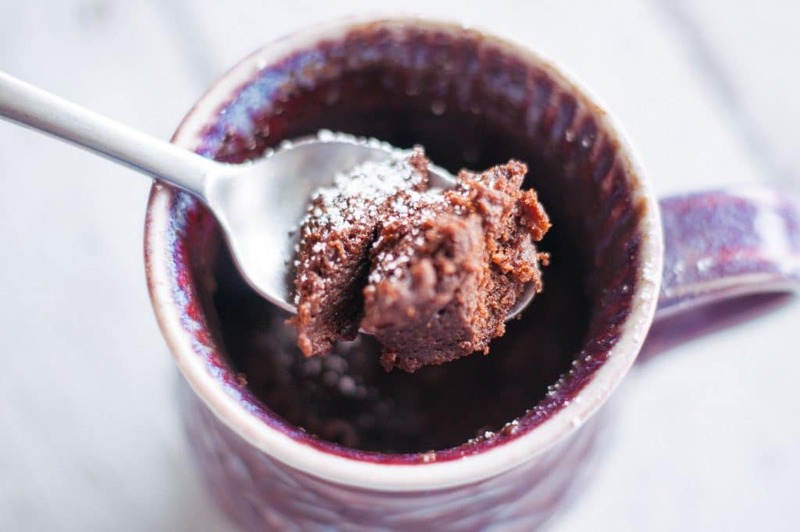 A chocolate mug cake recipe is one of those super simple desserts that everyone needs to have in their back pocket…just in case a situation arises. And in the case of my recipe below, you can certainly have it all by yourself, but I think mug cakes are best eaten with a scoop of ice cream, and someone you care about. The very first time I made a chocolate mug cake was at the end of 2013. I remember it quite clearly. I had landed in Canada just a couple of months before, and the temperature shock (there was an ice storm. AN ICE STORM! WHAT. IS. AN. ICE. STORM?!) had confined me to the home. One night, while watching an episode of Say Yes to the Dress, I decided I wanted chocolate cake. Which I believe is a completely natural impulse when watching Say Yes to the Dress. Of course, as the fates would have it, we didn’t have any cake – chocolate or otherwise – at home. And I only had a few minutes before the ads would end, and the show would resume. Mug cake was my only hope. I had never made it before. I went ahead without a recipe. What? I’m a maverick like that. It’s one of my most moderately tolerable qualities. Besides, all you need is some eggs, flour, cocoa powder, maybe a little milk, some oil. Toss it together in a cup, and throw it in a microwave. And you get chocolate cake in a microwave. It’s like magic! Except…my results were not magical, bestie. It was awful. It was a steaming, brown, mildly chocolate-flavoured sponge, stuck inside a cup. And once my cousins were done mocking me for the aforementioned steaming, brown, mildly chocolate-flavoured sponge I was forcing myself to eat, they told me that microwaveable mug cake was actually a product you could buy at the supermarket; something that I should pick up next time I went out. So, of course I promised myself there and then that I’d learn how to make a mug cake without having to resort to buying the premix. I scoured the internet for recipes, and I just couldn’t find one that I was happy with. Sometimes the mug cake was too crumbly, sometimes it was too spongy. Sometimes it tasted terrible. Other times, it tasted worse than terrible. And then I finally began experimenting, and this glorious recipe for 5-minute chocolate mug cake was born. It’s quick. Not kidding, you’re going to be eating it within 5 minutes! It’s easy. 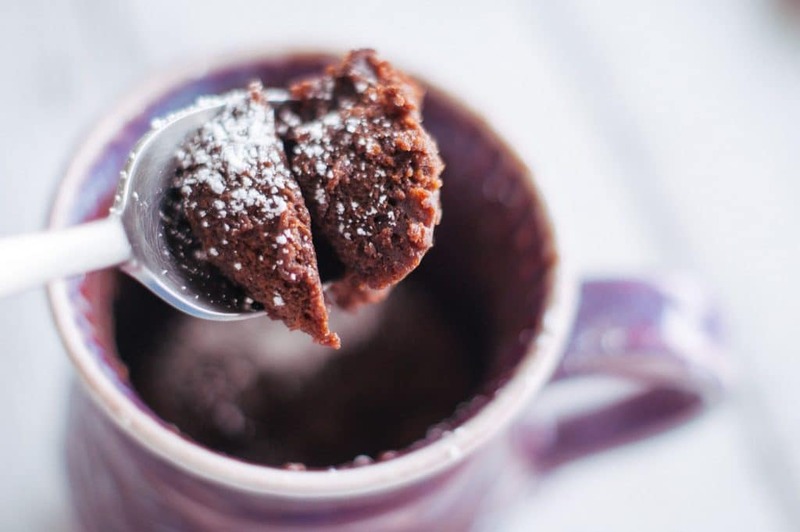 Doesn’t require any fancy ingredients, and though whipped cream and ice cream are excellent alongside this recipe, it does not require either to turn it into a delicious moist chocolate mug cake recipe. How does mug cake compare to real cake? Here’s the honest truth, bestie: Mug cakes (chocolate, or otherwise) are not the same as real cakes. However, they are beautiful and delicious in their own way. They exist to satisfy a very special craving. You know the one I’m talking about, that sudden need for chocolate cake; the feeling that if you don’t get a slice of cake in the next 5 minutes your soul will remove itself from your body to forever haunt the corridors of your apartment building while looking for an unattended slice of cake to make itself whole once more. Trust me, bestie. Nobody wants a hungry ghostie looming their corridors. Have you ever heard your stomach rumble? Imagine how scary that would sound if that rumbling was coming from a hollow-bellied apparition in your corridor. And if you happen to be looking for a real honest-to-goodness chocolate cake recipe, check out this Two-Layer Chocolate Cake with Whipped Cocoa Buttercream Frosting. Don’t overfill, otherwise it will spill. We all want a lot of cake. And seeing cake burst out of the top of a cup can be quite a sight too. But please refrain from overfilling your mug (your cup should be halfway filled, two-thirds full at the most!). You’ll save yourself from cleaning up a sticky mess in your microwave! 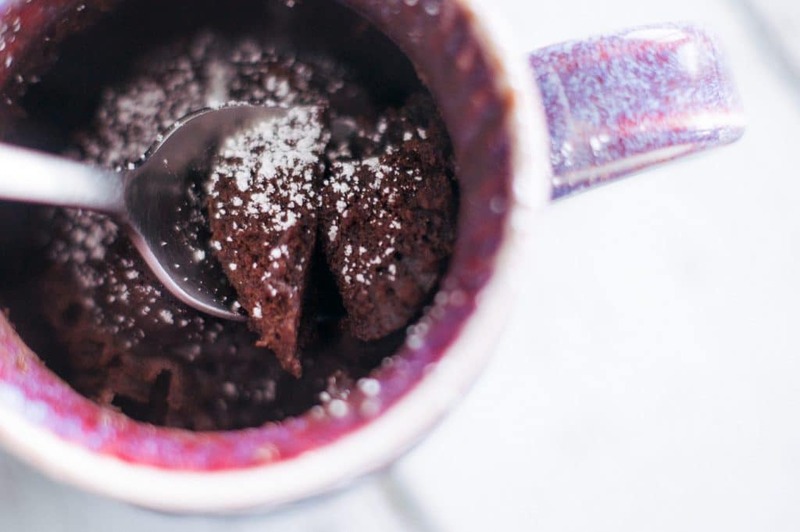 We’ve established that a chocolate mug cake is not exactly the same as chocolate cake. And to that effect, your mug cake does not need to be cooled. It won’t take long for a mug cake to lose its flavour and texture. So, once its ready, grab your spoon and any toppings you’d like and dig in! The links below are affiliate links. This means that if you choose to purchase using them, I will receive a small commission. And that would be lovely of you. Thank you. You will need a microwave-safe mug. Ideally something cute and talk-worthy, like this Flamingo Mug. Or if you, like me, feel like a lazy elephant that always misses your morning yoga routine…then this Namast’ay in Bed mug is perfect for you. Actually, it’s perfect for me too. Hold on. I’m ordering it for myself. That’s all for today! If you tried this recipe, please do comment below and let me know what you think! Or if you want to hear from me more often, please follow me on Facebook, Pinterest, Instagram, and Twitter. Or just sign up to be a part of my mailing list. My super market only has large, extra large and jumbo eggs, not medium or small. Would a large egg work in this recipe? Yes! Or rather, yes in the sense that you will get a slightly denser cake. 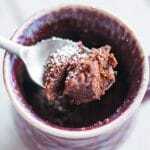 But you should still get a quick and delicious chocolate mug cake. For a crumblier cake, a smaller egg is the way to go. Alternatively, if you want to experiment – you could opt for the largest egg, and use 1.5x-double portions of everything else (though I’ve not tried that personally).Hope that helps! OK, I’m trying this, next time I have a late night craving! It sounds so crazily simple and delicious. I’ve never seen a mug cake in the store, and I know that if I did, I would never buy it, but this looks perfect. Bring on the next chocolate cake craving! Thanks for commenting, Colleen! And yes – perfect for late night cravings! I’ve never made a mug cake!! 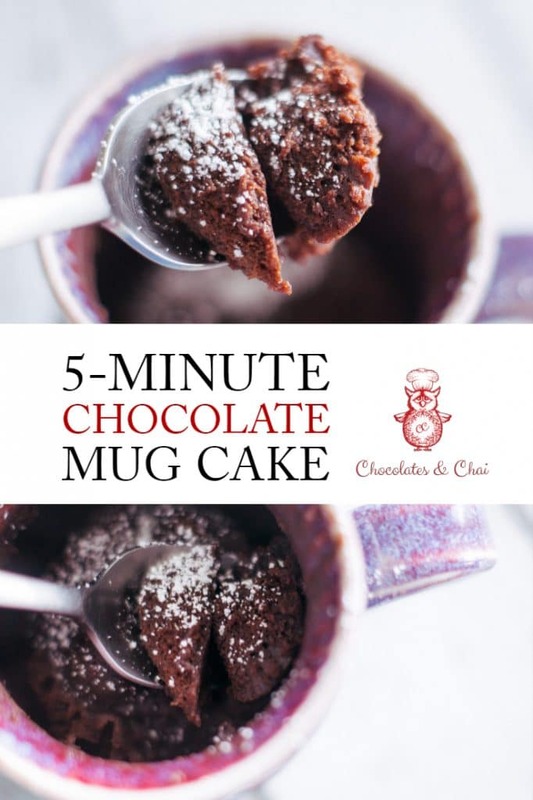 But this looks delicious, and what better way to satisfy a chocolate craving quickly than with a 5-minute mug cake! Hey Leanne! You’ve never made a mug cake?? You have to give it a try! Even if its just to know how they differ from regular cakes! Oh my, this sounds incredible – perfect for this chilly weather we’re having. Can’t wait to give these a try. Okay. This was just perfect. I had it with ice cream and chopped walnuts. Heaven! Hi there, Lindsay! Thank you for commenting…Ice cream and chopped walnuts..mmmm! Sounds fantastic!